Novaris threaded instrument protectors provide surge protection for most twisted pair signalling schemes and are designed to be installed directly at the field equipment providing protection against induced surges and transients. They are suitable for two, three and four wire instruments. The multistage design provides a high energy gas discharge tube (GDT) as primary protection for common mode disturbances, commonly associated with lightning strikes and power system earth faults and a secondary metal-oxide varistor clamping stage across the signal lines. 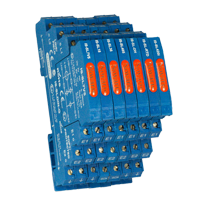 This combination provides very robust surge protection with high transient suppression and low let-through voltages. In addition protection is provided for cable screens which may be open circuit at the instrument. Certified to be intrinsically safe Novaris IS SPDs can be installed in the hazardous zone or the field side of the IS barrier. This not only provides protection for the PLC or RTU I/O, it also provides protection for the IS barrier. Novaris IS products are certified intrinsically safe according to IEC Ex and ATEX; the group IIC T4 certification makes it acceptable for use with all gas/air mixtures. With two different base options the SL protectors offer either direct earthing via DIN rail, for the most effective, low impedance earth connection (-G base) or a connection via GDT to the DIN rail, offering isolation under normal conditions and equipotential bonding during a surge (-EC90 base).